One of Britain’s strangest UFO flaps occurred on the Welsh coast in 1977. It has been known by various names, including the Dyfed Enigma, the Welsh Triangle case, or the Broad Haven UFO. The story begins with a group of schoolchildren. On February 5 1977, when 15 schoolkids at Broad Haven Primary School ran excitedly into their claiming to have seen a silver-suited spaceman coming out of a metallic cigar-shaped craft land in a field near their school. Perhaps not surprisingly, their teacher didn’t believe them and carried on with the lessons as normal. Yet some of them were adamant that they saw a silver alien with pointed ears emerge from the UFO. On getting out of school, however, they claimed they saw the spaceship again. Needless to say the teachers and parents were skeptical of the reports. So when the left the school grounds, they began to tell their friends, and any who would listen, but no one took them seriously. The next day, the students miffed by the adult inattention, delivered a petition to the police, demanding that they investigate the incident. 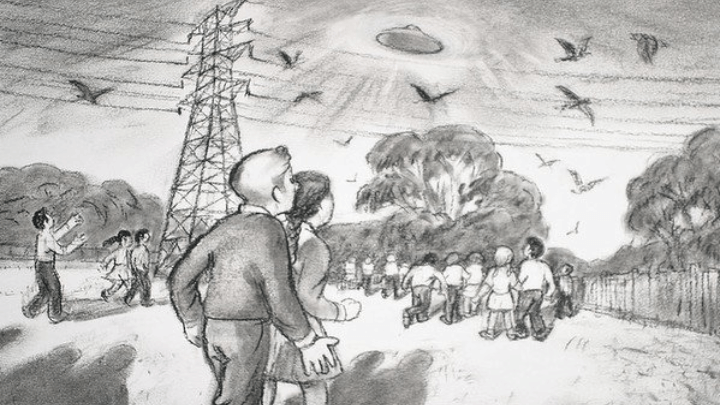 All the fuss forced the headmaster to take the children’s UFO sighting a little more seriously than he had before. So he gathered the children involved and asked them to draw what they had seen. Remarkably, the drawings were highly consistent, showing the same saucer-shaped UFO, with a dome on top of it, in their drawings. This first sighting heralded an extraordinary year of unusual happenings in Wales. As it unfolded, vast numbers of people claimed to see UFOs or to have had bizarre, paranormal experiences of similar kinds as the story gained national headlines, flooding the West Wales coast with reporters and television crews. Consequently the number of UFO incidents in the area increased dramatically. Was it all mass hysteria? Was somebody mischief-making? Was it the work of the military? Or had aliens actually arrived in Pembrokeshire? One family, in particular, was very severely affected by it all. The Coombs family, who were employed at the Ripperston farm, had a number of very strange experiences. Among these were sightings of UFOs from their car; a 7-ft silver-suited being with a black visor appearing outside their window; constant mechanical disturbances, including their car and television set repeatedly breaking down and having to be replaced; and their cows seemingly being teleported from one field to another! Another of the most famous incidents occurred around the Haven Fort Hotel in Little Haven. The owner of the hotel, a Mrs. Rose Granville, claimed she had seen a saucer-shaped UFO outside of the hotel window. Strange humanoids, wearing whitish boiler suits, emerged from the UFO and walked around for a bit as if gathering something. Mrs. Granville went to fetch other residents of the hotel to show them, but found the UFO and its mysterious occupants gone by the time she returned. Somewhat distressed by the encounter, Mrs. Granville wrote a letter to her MP who promptly asked the Ministry of Defence to investigate. As a result, Mrs. Granville received a visit from an RAF officer who listened to her story and professed himself mystified by it all. Some skeptics have claimed that the entire Broad Haven UFO flap was caused by hoaxers. It was noted that silver suits, somewhat resembling those described by the eye-witnesses, were in use at a nearby oil refinery. As happens in almost cases of persistent UFO activity in a specific area, hoaxing does soon enter the picture. Local yahoos see it as a great opportunity to have some fun. The Welsh Triangle flap was no exception. Indeed, some of the hoaxers have now come forward and admitted it publicly. The temptation is to dismiss all of the incidents because of a few fake ones. It’s difficult to see how hoaxers could account for all of the flying objects that were sighted, however, so fakery cannot provide a complete explanation for events in the Broad Haven area as a whole. The Broad Haven UFO flap was one of the most important in British history. The strange events there, which elicited interest from journalists and researchers throughout the country, have still never been satisfactorily explained.